Today I received three more XOs and had a great opportunity to meet more OLPC/Sugar-minded folks. Nine of us came to the OLPC office to hear Beth Santos speak about her OLPC deployment in Africa. Long story short, last summer 31 teams of students from all over the world participated in the OLPCorps initiative. Each team of students was given 100 XO laptops and $10,000 to start their deployments in Africa. The questions are: If children do not go to college after school and there are no technology related jobs in the country, what is the educational goal for children? And what is XO/Sugar role in particular? Is it to help children read and access great digital books? Or to develop special skills to help them become writers, musicians, painters, etc? Could those skills be used in business – arts and crafts, local newspaper, photostudio? Is the goal to connect children with the outside world? Or just help kids discover the world of games, and simply make their childhood happier? Is it a temporary tool for self improvement and development or is it long lasting? What if those kids only have access to the computers for one year, but they will never see/use computers ever again in their lives? How will that experience of owning a computer for one year will impact their life for better? From Beth’s presentation I learned for sure that kids love their XOs! And they are eager to learn. I visited my neighbor’s cat Bam Bam today. Everytime he sees me he keeps meowing, as if trying to say: “Where have you been? I need more affection and your presence!” And after I play with him, pat him, hold him in my hands, he still wants more. And I wonder if there is a limit to his desire to receive affection. I doubt there is a point at which he doesn’t need it anymore. Perhaps, it is the same with people’s desire to learn and discover new things, to receive knowledge. In São Tomé XOs brightened children’s world, put smiles on their faces and made them proud as every new piece of knowledge is a personal achievement, growth and progress. There is no limit to curiousity and desire to learn. And how children are going to use that knowledge in life is up to them. On Friday I officially received several great presents from Santa and my relatives, which are very nice, especially that coffee collage mug with my pictures. Thank you, dear sister! On Saturday Adam and I had working brunch to go through my questions about Sugar. The more I learn the more questions I ask, shouldn’t it be the opposite? I learned about Epub which is not an electronic pub, but book hub, where you can get digital books, and I downloaded fairytales by Anderson in English. We also tested flash drive usage and copy/paste function for several files in different formats. It turns out we can successfully read MS Word documents on XO! We talked about great books on education, volunteering and charity work, among which are Three Cups of Tea, Mountains Beyond Mountain, Into the Wild and others. On Sunday, I had another working brunch with Caroline Meeks, who I met at the NYC OLPC meeting. She works as a volunteer on Sugar and tries to improve it and make it work on other computers, not just XOs. 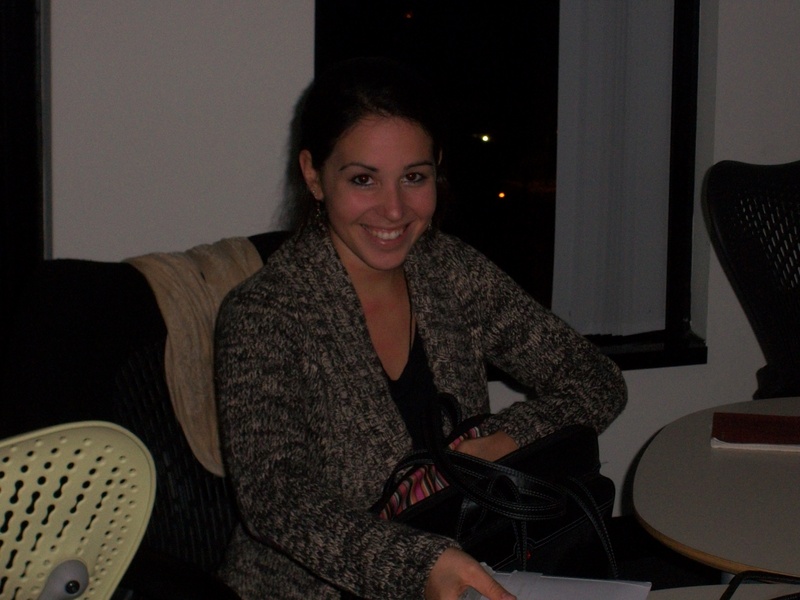 She helped me to revise my objectives and pointed out several skills I need to build before I leave in two weeks. Thank you, Caroline! Since my induction to the support gang, I received emails from people interested in starting their own deployments in central Vietnam, rural Cambodia, India and Ukraine! Thank you for placing an order with Books Beyond Borders. You have helped us to further our mission of turning old books into new schools. We donate all net proceeds to Project Schoolhouse and its school building projects. More info is available at www.projectschoolhouse.org. Please let us know if you’d like to be included in our mailing list. Thank you for your order, Books Beyond Borders Customer Service. It is a holiday season in Boston. While there is some downtime at work, I’d like to tell you how it all started. First time I heard about OLPC was probably two years ago, when my friend sent me a link about the company and what it is trying to achieve. More up-to-date info is here: About OLPC. On Oct 24, 2009 I attended the Boston Book Festival http://www.bostonbookfest.org where Nicholas Negroponte, the founder of OLPC, spoke about the company’s mission and demonstrated an XO. He talked about deployments in Africa, and I was impressed that they provided laptops and hundreds of e-books to children in remote locations. As a result, children in some places taught their parents to read! Wanting to learn more about the company, I emailed OLPC. Later I found out that they don’t really have a customer service department and therefore no phone number at which they can be reached. Not hearing back from them, and not being able to phone them, I decided not to give up, but do more research. I joined OLPC group on Facebook and found out about an upcoming OLPC meet-up in NYC on Nov 21. Church of St Mary the Virgin on 133 W 46th was an unusual place to have a technology related meeting but I climbed the stairs to the third floor and found a room full of people. I also met Mafe who is part of OLPC group in Philippines and a volunteer on eKindling project in Lubang, Mindoro. And finally I met Adam Holt, who officially works for OLPC, unlike many others, and who is from Boston! Adam is in charge of technical support, community liason, contributors program and many other things. This meeting, organized by Jim Lombard, drew people from all walks of life, united by the same idea of education by means of technology for kids around the world. Several people talked about deployments at different locations, including Virginia/DC area, New York, San Francisco, Philippines, Nepal, etc. Adam became my main link to OLPC. So I told him that I wanted to start a deployment in Vietnam. But he said that they already have one that just started in Hanoi area, Vietnam. I was surprised. Later at home I checked OLPC Vietnam page and found Vung Vieng Fishing project started by Nancie Severs not far from Ha Long Bay. After reading Nancie’s blog, I realized that at the time of Boston Book Festival she was on her way to the village with 12 XO computers, and by the time of the NYC OLPC meeting, children already had ownership of the XOs and were using them in full mode. I always thought that gang is a bad group, like those that rule in my neigborhood. .. But Adam proved me wrong: not all gangs are bad… OLPC support gang is a great one and I became a member of it today. I don’t really know all my responsibilities yet, but it feels good to be part of a community solving problems. I’m sure that is what Bam Bam thinks too, he is a cat I visit while his loving parents are away. He is so happy to see me, and not beacause I refill his food plate when it is empty, but because he feels he is part of a community too when I show up, he is not lonely in his one apartment world. We spent an evening together reading XO and Sugar manuals. Today is a cold day, but not as cold as yesterday! I knew that a snowstorm was coming but I didn’t realize how it would impact my agenda and logistics. So yesterday while it was snowing around 1PM, I had to walk to Mass Ave and grab a cab to reach Sander’s theater in Cambridge for their annual Christmas performance, they didn’t cancel due to snow. I was surprised to see that I wasn’t the only spectator, but among hundreds of other curious souls. As it was my first time I marveled at how beautiful the church was. The show was amazing, with lots of traditional American folk dancing and carol singing and story telling. In spite of snow all of these people made it to the theater, including 60 or more actors! Right after the show ended I made a transition by metro to Kendall Square and was welcomed to One Cambridge Place by Adam. 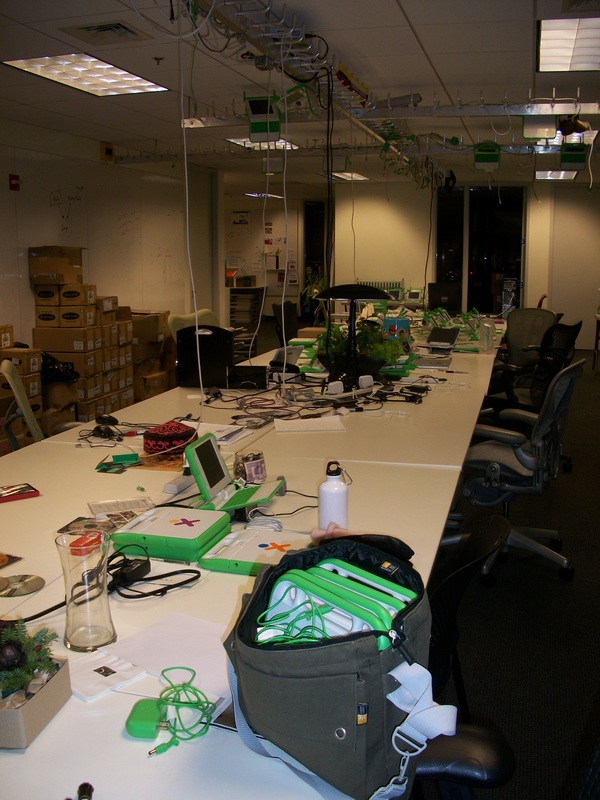 Here I was in the headquarters of OLPC, with no people in the office as it was a snowy Sunday. Adam gave me a tour and I picked two XO laptops of my choice, they were returns and one belonged to Mimi. We wiped out the history and updated them with a new version of open source Sugar software. Adam surprised me by suggesting meeting on a Sunday after his weekly conference call and actually showing up at the office for real! He gave me a demo of several activities and we tested Mesh networking capabilities and even made 2 min. video clip! Loaded with XOs, their accessories and a little manual power generator, I left the building and headed home to embark on an educational journey which in three weeks will lead me to Saigon, Vietnam and other virtual and real places in the world.